If you would like to see this page in Swedish, click here . This page has been visited times since 98-12-13. TÄBY SJÖFLYGKLUBB is the only seaplane club in the Stockholm area. The club is situated north of Stockholm City, in Hägernäs, Täby, Sweden. It is located on historic ground at the lake Värtan, where the Swedish Navy experimented with aviation as early as 1912, only a few years after the Wright brothers. Later the Royal Swedish Airforce formed a base for seaplanes here. It is closed since 1975, but many buildings are still there, though now chiefly used for different purposes. The SEAPLANES of the club. The club has, at the moment, one seaplane. 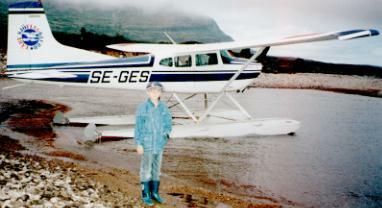 A CESSNA 185 on EDO floats. It has six seats and a endurance of six hours at 120 knots. It accommodates four persons, 90 kilos each and fly for five hours with that load. E.g. not much compromising. The engine is a Continental IO-520 of 300 HP. The members, who also are partowners, pays 1000 SEK per hour for flying the C185. It flies about 200 hours a year, mostly from April to October. In the winter season it is hangared in Hägernäs and maintained, partly by the members. CESSNA 172, SE-IBD. Owned by the group Våta Tofflor. CESSNA 180, SE-CXM. Owned by 2 members of the club. CESSNA 185, SE-FMX. Owned by 3 member. MAULE M5-235 ,SE-GRV. Owned by 1 member. The owners of the seaplanes above mostly do not let nonowners fly them. NEWS! NEWS! The new seaplane used for training is SE-IXN, a CESSNA 172 Reims Rocket. A CESSNA 172 with more powerful engine and constant speed prop. The owner is SJÖFLYGARNA AB, the only SEAPLANE TAXI COMPANY in Stockholm, but the plane is located at TÄBY SEAPLANE CLUB. This seaplane is for rent after a checkride with the instructor and a written test. The hourly rate is 1200 SEK/hour incl. vat. Contact Susanne Hagström tel. +46-8661 41 30 for more information. How to become a seaplane pilot? How to become a member of TÄBY SJÖFLYGKLUBB? If you are not a seaplane pilot or don´t hold a private licens, you have to start with a private licens. At the page airline pilot and flight instructor you can get some information how to start flying. When you have got your private licens, you can contact me, lundholm@skyways.se and I will teach you seaplane flying. Back to the Christer Lundholm home page.